During the course of its five-year nominal mission Gaia is expected to observe several hundred thousand asteroids. Many of these will be in the main asteroid belt, located between Mars and Jupiter. One of the strengths of Gaia is that it will also observe regions that are not extensively observed by existing ground-based surveys – this gives it the potential to find asteroids in areas where others would not, or could not, look. Ground-based observations are made during the night when the angle between a source and the Sun is fairly large. Gaia can make observations at any time and hence observes objects much closer to the Sun. 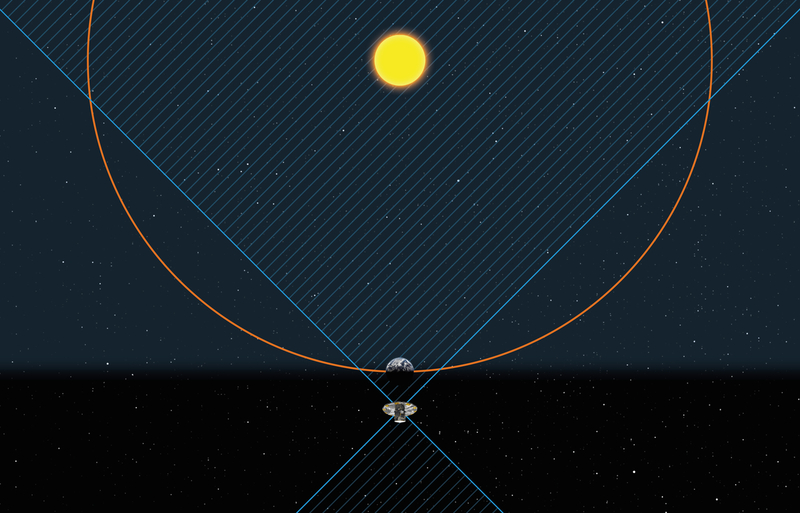 In particular, Gaia is ideally situated to probe the region between the Sun and Earth. This is where the Atira asteroids are found, orbiting inside Earth's orbit. To date, only 16 of these asteroids have been discovered. The dashed lines indicate regions of the sky that are unobservable by Gaia. All other regions are accessible to Gaia, including swathes within Earth's orbit.